Made of elegant heavy brocade fabric, this challah cover combines the beauty of Shabbat and Jerusalem in a unique and creative fashion. The center of the challah cover boasts a large Kiddush cup that has the classic Jerusalem scenery craftily embroidered into it. On each side there is a lit candlestick with lit candles and the light emanating from them. The background has challah, sheaves of wheat and flowers gracing and adding color to this artistic picture. 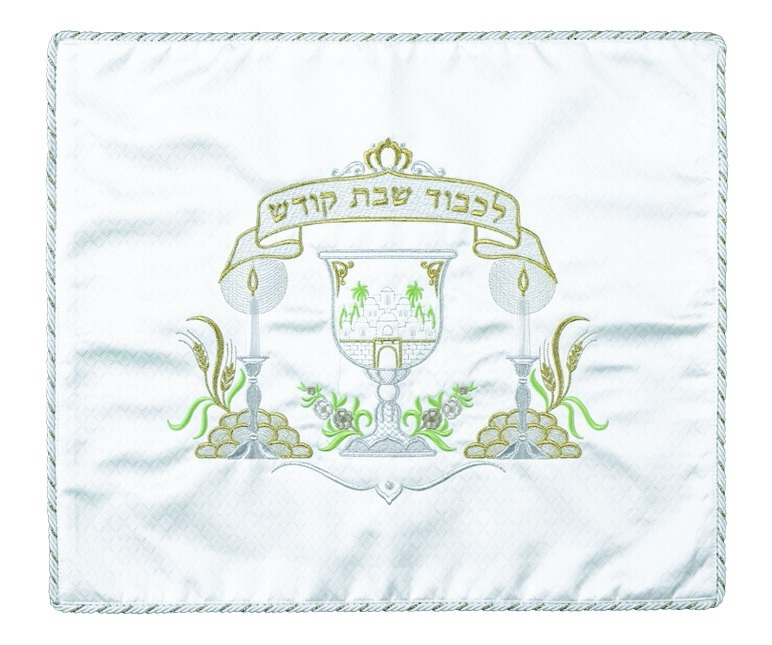 The Hebrew words “Likavod Shabbat”, which means “In honor of Shabbat”, are embroidered in a banner above the design. The edge of the challah cover is bordered by an elegant rope trimming.